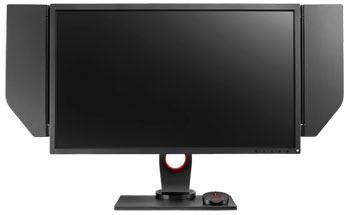 Some basic information about this monitor was announced a few weeks ago by BenQ Zowie, but the screen has now also appeared on the BenQ.com website. The webpage states: "XL-series features the premiere monitors for PC e-Sports, fine-tuned to guarantee the smoothest and responsive experience, and the clearest images to arm you for competition." The screen itself is 27" in size and features a 2560 x 1440 resolution TN Film panel. DL-DVI, 2x HDMI and DisplayPort video connections are available along with a headphone and mic jack. The other spec doesn't seem to be listed yet but expect the familiar 1000:1 contrast ratio, 170/160 viewing angles, 16.7m colour depth and sRGB gamut. Although not listed on their website, we anticipate this new model will just be an update to the XL2730Z and so will offer a 1ms G2G response time, FreeSync support and an integrated Blur Reduction mode as well. One of the key new features being promoted on this model is their exclusive new "DyAc" (Dynamic Accuracy) technology. This is designed to "maintain remarkable clarity during in-game movement that achieves a smoother experience, enabling players to swiftly capture and hit the targets." Obviously you may want to take the marketing images (above) and video with a pinch of salt, but it does sound and interesting technology and one we'd like to test when we have chance. Another new feature they've added is the "shield", which is a nicely adjustable side hood attachment for the screen designed to help you focus on the screen and gaming and avoid distractions. The familiar S-switch device makes a return on this screen allowing you to easily switch between settings, now featuring built in memory as well, and the Black eQualizer setting is also available to boost gamma in darker areas of your content. The stand is fully adjustable allowing you to reach a comfortable position for your gaming needs. As ever, the screen is flicker free and features blue light filters also. 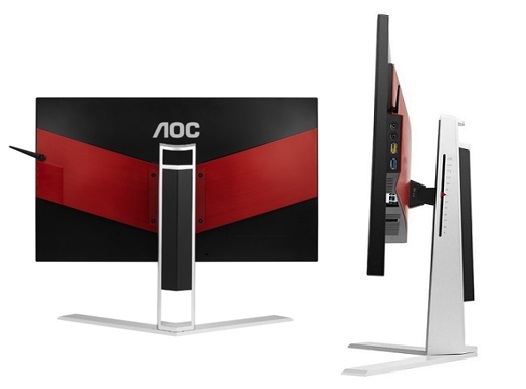 AOC have announced the first 24" range (23.8" in size) monitors in their new AGON line-up of gaming screens. The AG241QG and AG241QX feature 2560 x 1440 resolution 23.8" TN Film panels, with a whole host of features aimed at a gaming audience. There are two flavours offered here. Firstly there is the G model with NVIDIA G-sync, 165Hz refresh rate and support for ULMB blur reduction as well. Then there's the X model with slightly lower 144Hz refresh rate and support for Adaptive Sync (FreeSync) instead. Both have a 1ms G2G response time from the TN Film panels for great gaming experience. AOC also talk about the low input lag in their press material which shows they have a focus on providing low lag for gaming which is good news. Spec wise the panels offer a 2560 x 1440 resolution, 1ms G2G response time, 1000:1 contrast ratio, 350 cd/m2 brightness, 170/160 viewing angles, 16.7m colour depth and sRGB colour space. The AOC AGON AG241QX will be available in August 2016 for an MSRP of £389 and the AOC AGON AG241QG for an MSRP of £519 in September 2016. Acer have recently announced the release of a new 30" ultra-wide model in their Z1 gaming monitor series. 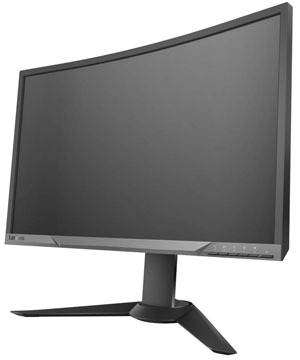 The Predator Z301C model offers a 2560 x 1080 resolution and a curved format (1800R curvature). The VA panel being used supports up to 200Hz refresh rate which we believe to be achieved without the need for overclocking, using one of AU Optronics' new AMVA panels (M300DVR01.0 most likely). Whether the VA panel can offer response times fast enough to make this 200Hz refresh rate practical, and whether you can power a screen with this resolution at that kind of refresh rate reliably is another question of course. NVIDIA G-sync is also provided to support dynamic refresh rates. In other specs the screen offers a 4ms G2G response time, 3000:1 contrast ratio, 100% sRGB coverage and 178/178 viewing angles. Tilt, height (120mm) and swivel adjustments are expected to be offered from the stand and given the NVIDIA G-sync module we would expect to see DisplayPort and HDMI inputs provided. There are also 2x 7W DTS speakers included. The design looks to be similar to that of the Z35 we have already reviewed. No word on price or release date yet but we know the expected panel should be in mass production now from AUO. Probably 2 - 3 months we would predict before the screen is released. We will update this news piece if we get any further information from Acer as well. Periodically we try to bring you news on the panels in production or planning from the key panel manufacturers. 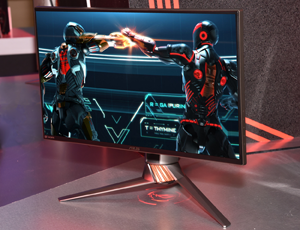 Knowing what panels they are working on can give us some early insight into the type of monitors we might expect to see later on once they are adopted by the manufacturers. The dates provided below are the expected dates for production of the panels themselves, so there's normally a good few months before we then see news of any monitors making use of them, and then a few more months lag before any screens are actually available. Still, it gives us a nice indication of developments we might see this year. Earlier this month we brought you information about the LG.Display and Samsung panel roadmaps, and now we have some information from AU Optronics as well. As a brief intro summary, AUO continue to invest in several key areas. Of particular interest are the new gaming panels they are developing, with Full HD (1920 x 1080) options reaching up to 240Hz native refresh rate later this year and QHD (2560 x 1440) reaching the same 240Hz refresh rate during 2017. We will also see the emergence of 4K resolution 144Hz refresh rate panels by 2017 as well. In addition to there are further developments with VA technology curved panels, now pushing the refresh rates up to 200Hz native and with resolutions up to 3440 x 1440. New panel sizes and formats will also be introduced. Finally, an investment in 4K and 5K resolution screens for a variety of uses continues to be a focus with various options being considered. Full HD panels with 240Hz refresh rate - two gaming panels are in production offering 1920 x 1080 full HD resolution and a massive 240Hz refresh rate. They are available in 25" and 27" sizes and are TN Film technology. The 25" panel (M250HTN01.2) should be in production during June and the 27" (M270HTN02.3) will follow in August. The 25" sector is a new venture for AUO as well, as they've not produced panels in this size before. The 25" panel could well be the panel featured in the recently announced Asus ROG Swift PG258Q which was showcased at Computex. It remains to be confirmed, but that was advertised as having a 240Hz refresh rate and so the spec fits. Curved VA panels with up to 200Hz refresh rate - these are planned in various sizes, offering curved formats (1800R curvature) and VA panel technology. Going in to production in June/July is the largest size, which is a 35" 21:9 aspect ratio panel with 3440 x 1440 resolution. This will have options for a 100Hz (M350QVR01.0) and 200Hz refresh rate (M350QVR01.1) apparently. Back in January we had information about this 35" panel which was listed with a 144Hz refresh rate, but it looks like AUO have now pushed this refresh rate even higher up to 200Hz. With a 3440 x 1440 res and that high refresh rate, DP 1.2 will not be sufficient but it remains to be seen how this screen will be connected. In the same 35" size is another curved (2000R) VA panel but this time with a 2560 x 1080 resolution and 200Hz refresh rate (M350DVR01.2). This should go in to production during June to complement the existing 144Hz version (M350DVR01.0) already used in various screens such as the Acer Predator Z35. Then there's a new 31.5" sized 16:9 aspect ratio panel scheduled for some time in Q4, with 2560 x 1440 resolution and 144Hz refresh rate. This is the first 31.5" sized panel we've seen mentioned by AUO up until now and will also mark the first high refresh rate VA panel we've seen in this size and resolution. The planned 30" widescreen 2560 x 1080, VA technology, 21:9 aspect ratio panel (M300DVR01.0) has also now gone in to production and the spec has been updated slightly now with a 1800R curvature (instead of 2000R expected before) and a boost in the refresh rate from 144Hz to 200Hz. Finally there's a 27" 16:9 aspect ratio VA panel also in the planning phase (no date or part number yet) with 2560 x 1440 resolution and 144Hz refresh rate. Again the first VA panel of this size and resolution we've seen with high refresh rate. In fact there's been very few high refresh rate VA panels ever released, only really the 23.5" 1920 x 1080 resolution 120Hz VA panel from Sharp (as featured in the Eizo Foris FG2421 back in late 2013), and more recently the 35" 2560 x 1080 resolution 144Hz native VA panel from AUO as featured in a few screens including the Acer Predator Z35 early in 2016. More 4K and 5K options - AUO will also invest in more high resolution panels with 4K (ultra HD 3840 x 2160) and 5K (5120 x 2880) options available. A new line of 32" sized 'value' panels are expected to go in to production in November 2016 based on TN Film and/or VA panel technology with 4K resolutions (no part numbers yet). 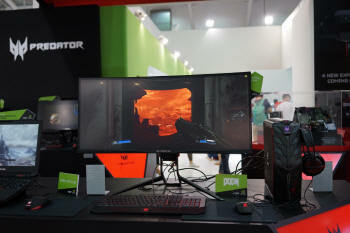 At some point in late 2016 the 144Hz refresh rate 27" size AHVA (IPS-type) 4K panel showcased recently at Computex is expected to go in to mass production as well which is bound to attract some attention for gamers (again no part number yet). Finally a new 32" sized AHVA (IPS-type) panel with 5K resolution is expected to go in to production in Feb 2017 with Adobe RGB colour space and will be aimed at higher end use and graphic application (part number not known). Don't confuse this with the eagerly anticipated UP3017Q! That is Dell's exciting OLED based model with 4K resolution. The UP3017 was a model we saw teased during May via an accidental information leak on their website. This new screen is the new 30" model in their range, which looks to be a replacement for the U3014 from a few years ago. The actual product page has now appeared on Dell's China website so we know a little more about it now. As we anticipated back in May, the new UP3017 is aimed at professional uses and is based on a 2560 x 1600 resolution IPS panel. As the 'UP' product name suggested, this screen features a wide gamut LED backlight system and so offers a colour space covering 99% Adobe RGB. The screen comes factory calibrated with a dE <2 and also offers hardware calibration using Dell's calibration software and a compatible calibration tool. In other specs the screen has a 6ms G2G (fast) / 8ms G2G (normal) response time, 1000:1 contrast ratio, 350 cd/m2 brightness, 178/178 viewing angles, 1.07 billion colour depth and 16:10 aspect ratio. There are DisplayPort, Mini DP, DP out and 2x HDMI connections offered along with a 4 port USB 3.0 hub. The usual full range of tilt, height, swivel and rotate adjustments are offered from the stand and a KVM and PiP/PbP function are also supported by the display. No word on UK or US pricing or release yet but we'd expect it to appear on more regional Dell webpages in the near future along with further information. 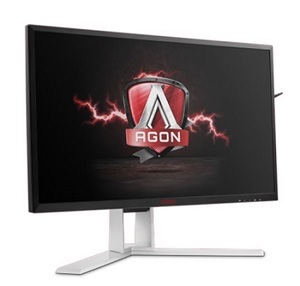 AOC have recently announced their latest AGON gaming series monitor. 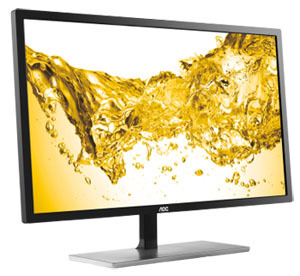 The AG271QG is a 27" screen based on a 2560 x 1440 resolution IPS-type (AHVA) panel. The screen boasts a 165Hz maximum refresh rate and NVIDIA G-sync support, putting it as a direct rival to popular screens like the Acer Predator XB271HU and Asus ROG Swift PG279Q. In other specs the screen offers a 4ms G2G response time, 1000:1 contrast ratio, 350 cd/m2 brightness and 178/178 viewing angles. DisplayPort and HDMI inputs are provided along with 4x USB 3.0 ports, and the stand has a full range of tilt, height, swivel and rotate adjustments. There are 2W integrated stereo speakers and AOC also promote the flicker free backlight. The screen doesn't look like it will support NVIDIA ULMB blur reduction though as it's not mentioned on the product page or spec sheet. The AOC AGON AG271QG premium gaming monitor, specially designed for enthusiastic gamers, will hit stores in July 2016 for an MSRP of £639. A new 31.5" IPS panel (part number tbc) with "8K4K" resolution of 7680 x 4320. This has a 280 ppi and spec wise it offers a 14ms G2G response time, 1300:1 contrast ratio, 178/178 viewing angles and 400 cd/m2 brightness. It is not expected to go in to production until Q1 2017. 27" LM270WR5 IPS panel with 3840 x 2160 Ultra HD resolution. This panel is expected to go in to production around October time and will offer a borderless design (Neoblade III). It will offer a 14ms G2G response time, 1000:1 contrast ratio, 350 cd/m2 brightness, 178/178 viewing angles and Adobe RGB colour gamut. The 31.5" LM315WR1 IPS panel we saw mention of before, but now we have some further specs for this panel which is expected to go in to production around Q4 2016. We now know it will offer a 3840 x 2160 Ultra HD resolution, 14ms G2G response time, 1000:1 contrast ratio, 350 cd/m2 brightness, 178/178 viewing angles and sRGB colour gamut. This panel is a borderless design (Neoblade III) as well. LTM240CL07 panel. 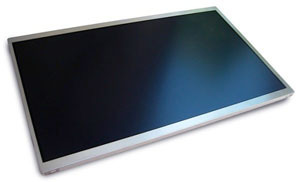 This is a 24" PLS (IPS-type) technology module, with 1920 x 1200 resolution. This particular panel has a wide gamut Adobe RGB colour space coverage, and Samsung also list it with a "retardation pol" option. This is similar to the old A-TW polarizer made popular by LG.Display quite some years ago, and designed to help minimise IPS-glow on dark content. You don't see those used very often so it's interesting to see it listed as an option. There is also a 23.6" VA technology panel planned for later this year. 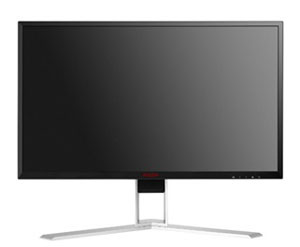 The LSM236HP02 (revision tbc) will by a 1800R curved screen with 1920 x 1080 resolution. The 60Hz version of this panel should be in production now as of April 16, with a 144Hz refresh rate version also planned for production from July 16. The LTM270HP02 is a 27" VA technology panel with 1920 x 1080 resolution. This is a 1880R curved panel with 144Hz refresh rate support. It was scheduled to go in to production in May 16. The LSM290DP01 panel comes in two versions, one 60Hz and the other 144Hz. This is a rather unusual 29" mega wide panel with VA technology. The resolution is listed as "FHD+" which we believe to be 3840 x 1080, with a 32:9 aspect ratio. 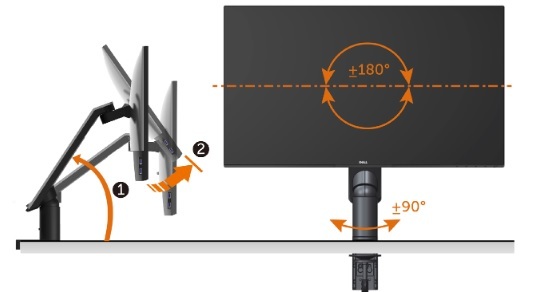 The 60Hz version of the panel is 3000R cuvred, while the 144Hz version is 1800R curved. The LTM340YP03 we knew about before, but not by part name. 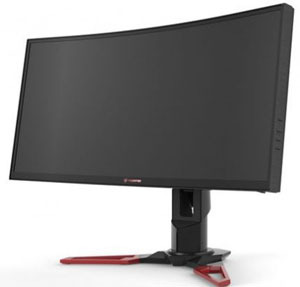 This is a 34" 1800R curved ultra-wide screen with 3440 x 1440 resolution. It's based on VA panel technology and will offer a 3 side frame less design and refresh rate support of 100Hz. 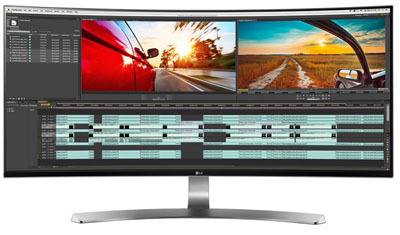 We know LG.Display are pushing their 34" 1440p IPS panels up to 144Hz, so perhaps this will change with Samsung by the time it goes in to production, currently planned for September 2016. On the other hand, maybe they've not been able to drive response times low enough on the VA technology to make anything more than 100Hz practical. There are two versions of the LTM315HP01 panel now in production since April 16. These are 31.5" in size, VA panel technology, 1800R curved and have a rather low 1920 x 1080 resolution for this screen size. There are 60Hz and 144Hz versions available. Another panel (part number tbc) in this size and format but with 2560 x 1440 resolution is planned for Sept 16, with VA technology and 144Hz refresh rate support. Just to make the distinction as well, we are talking about LG.Display and Samsung as a panel manufacturers here, not Samsung and LG as a monitor manufacturers. Once panels go in to mass production it's usually 2 - 3 months before we see them picked up by any monitor manufacturer, and then another couple of months usually before those monitors are widely available to buy. We have updated our panel parts database with all this new information as well. LG.Display look to be finally investing in development of high refresh rate IPS panels. We've seen the odd panel mentioned in their roadmaps in the last couple of years but never seen anything go in to final production, or at least be adopted by any monitor manufacturer. Meanwhile rival panel manufacturer AU Optronics have been developing their equivalent AHVA IPS-type technology with high refresh rate for a while now, resulting in the World's first 27" 2560 x 1440 IPS-type panel with 144Hz refresh rate back in Feb 2015 in the form of the Acer Predator XB270HU. Further models in this size have followed from Asus, Eizo and others. 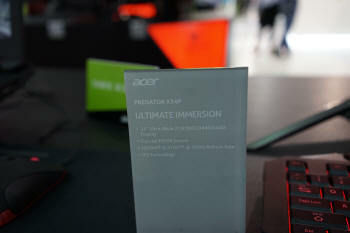 More recently AUO have developed a prototype 27" 144Hz IPS-type panel with 3840 x 2160 Ultra HD resolution, which was shown off at this year's Computex in an Asus display prototype. So it's about time LG.Display joined in the high refresh rate IPS market! Perhaps the most interesting panel is planned for Q1 production 2017 at the moment. This is a new version of the LM340UW3 panel (revision tbc). 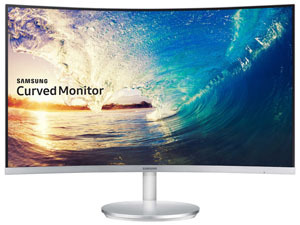 This is a 34" curved ultra-wide IPS panel (1900R curvature) with a 3440 x 1440 resolution. It will offer a 144Hz refresh rate as well! Current 34" widescreen displays are making use of a native 60Hz IPS panel from LG.Display, overclocked in some cases to 100Hz maximum where a G-sync module is added to the screen. With the arrival of this 144Hz native panel we assume it will also need to use DisplayPort v1.3 connectivity but this will allow refresh rates to be significantly improved in this sector. With a native support of 144Hz we may also see some screens paired with blur reduction backlights which would be welcome in the 34" space as well. Nothing else staggering from the current listed spec which is updated in our panel parts database. Additionally there is a 2560 x 1080 resolution IPS panel of this same size (34" ultra-wide, curved, 3800R curvature) planned for production a little sooner, in August 2016. The LM340UW1 (revision tbc). Just to make the distinction as well, we are talking about LG.Display as a panel manufacturer here, not LG as a monitor manufacturer. Once panels go in to mass production it's usually 2 - 3 months before we see them picked up by a monitor manufacturer, and then another couple of months usually before those monitors are widely available to buy. So although it's exciting news that we will see some 34" 3440 x 1440 IPS panels at 144Hz eventually, it won't be until mid 2017 by the look of it - at least based on these LG.Display panels. Acer are set to release an interesting new format screen in their range in the near future, with a bit of information starting to appear online. The XR382CQK is a whopping 37.5" in size, and is an ultra wide format. The aspect ratio is an unusual 2:4:1, with a 3840 x 1600 resolution. 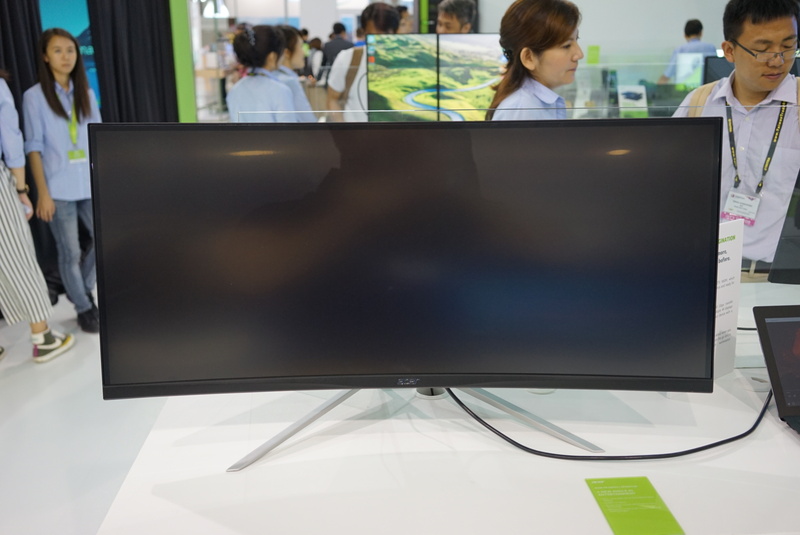 It's a curved IPS panel as well, with 2300R curvature. Acer say that it will offer adaptive-sync support as well for gaming needs. Based on the limited information available at the moment we expect the screen to be based on LG.Display's new LM375QW1 panel which would also offer 1000:1 contrast ratio, 300 cd/m2 brightness, sRGB gamut, 178/178 viewing angles and is expected to go in to production in Sept 2016. With that in mind, we would expect to see this screen released towards the end of the year at best. Given the use of FreeSync we would expect multiple inputs to be offered, but refresh rate will be limited to 60Hz, maybe 75Hz if we're lucky. At this years Computex event Asus have showcased an exciting new prototype screen. There's very little information available yet or course as it's only in prototype stage, but the screen is based on a 4K 27" panel and supports refresh rates up to 144Hz. We expect by "4k" they mean Ultra HD 3840 x 2160 resolution here by the way (now confirmed). This would be the first official sighting of a 4K screen with high refresh rate and is also the first we've seen based on the DisplayPort 1.3 standard. This new DP interface allows for increased bandwidth throughput, allowing 4K @ 144Hz to finally become a possibility. DP 1.2 has insufficient bandwidth to support this and so we've been waiting for DP 1.3 to be adopted by graphics card and monitor manufacturers to overcome this. The prototype is based on a TN Film IPS-type technology panel (AU Optronics AHVA), but remember this is a very early proof of concept. Asus will be limited by the panels available as well don't forget and so the choice of available panels and technologies will improve over time as 4K @ 144Hz becomes possible. No word on any other features like FreeSync or G-sync at this stage, and we suspect this was more a case of trying to show 4K @144Hz with DP 1.3 was possible. Update 1/6/16 - this video from the Computex event confirms that this prototype is actually IPS technology (AHVA from AU Optronics) instead of being TN Film, so that's exciting news. It also confirms out suspicion that the resolution is 3840 x 2160 Ultra HD and confirms that the refresh rate is indeed 144Hz. The spec sheet also says it will offer tilt, swivel, pivot and height adjustments from the stand. 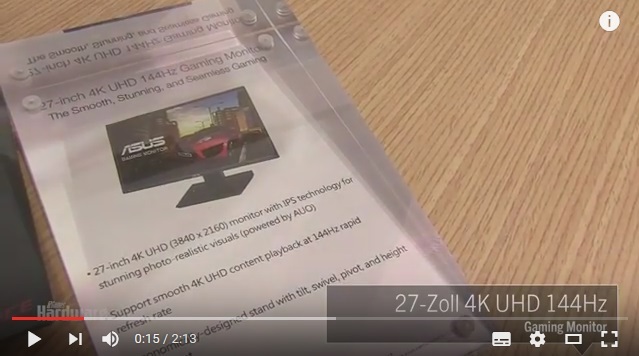 Update 7/6/16: Linked to this, AU Optronics have announced at the same time that their Ultra HD 4k AHVA (IPS-type) panel is being shown off at Computex, meaning that it must be their panel being used in the Asus prototype. We're not sure where the original source of this information is from, but thanks to a user on Reddit we have some news of what appears to be an update to the popular Predator X34 monitor showcased at Computex 2016. The new Predator X34P offers a similar spec to its predecessor from what we know so far. It features a curved 34" panel with 3440 x 1440 resolution. An IPS panel is used again and NVIDIA G-sync is supported. The spec card shown here lists a 100Hz refresh rate and although some of the comments suggest this is a "native" support, we still believe that it is based on an overclocking feature given that there is (as far as we know) no 34" IPS panel with >60Hz produced. Whether Acer have done something to guarantee this 100Hz or not we don't know. We can tell a few differences from the photos above. There is now a joystick on the back left (when viewed from behind) for controlling the OSD, instead of the buttons on the bottom right hand edge of the screen. Acer have moved the 4x USB ports to be located a little further away from the video connections and there also appears to be a side to side swivel function added - from the silver ring section on the stand. The back of the screen is now finished in a matte black plastic instead of the glossy finish of the older X34 model. 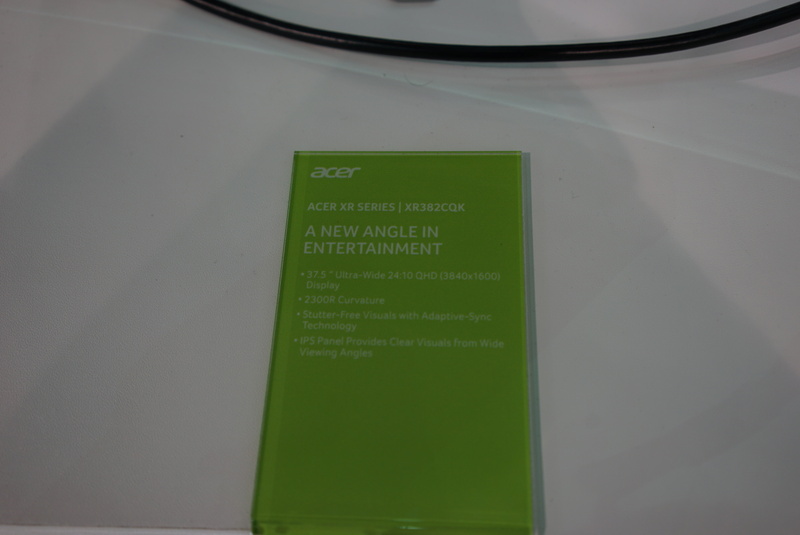 An Acer rep apparently estimated a Q4 release date, but no price was known at this time. It's been a busy week for Asus at the Computex event! As well as announcing the new ROG Swift PG248Q, they've also now announced a slightly bigger 24.5" display, the ROG Swift PG258Q. This screen will be based on a 1920 x 1080 resolution TN Film panel as well, offering a 1ms G2G response time and support for NVIDIA G-sync. Asus have boosted the refresh rate even more on this model up to a whopping 240Hz using an overclocking function (see update below). Whether or not this provides any practical or useable benefits remains to be seen but it's an impressive sounding spec. This model is based on ROG's new Armor Titanium and Plasma Copper colour scheme like the ROG Swift PG348Q we've tested, and has built-in ROG light effects on its stand to add ambience to gaming set-ups. In addition, Swift PG258Q features ASUS GamePlus in-game enhancements and ASUS GameVisual technology for optimized gaming visuals. We expect to see DisplayPort 1.2 and HDMI ports offered, and the screen is likely to be flicker free as with most of Asus' new models. We also anticipate the inclusion of ULMB given the high refresh rate and G-sync support, although likely only up to 120Hz. Further information, pricing and availability are unknown at this time but we will update this news piece when we hear more. Update 8/6/16 - Asus have informed us that the 240Hz refresh rate is not through overclocking. We are waiting for more information from them on how this is achieved and how it works exactly. ASUS Designo Curve MX34VQ (pictured above) is a 34-inch curved monitor with a frameless 1800R curvature 3440 x 1440 ultra-wide QHD panel. In addition, MX34VQ features 8-Watt stereo speakers incorporating Harman Kardon and ASUS SonicMaster audio technology, as well as a Qi wireless charging pad on its stand for Qi-enabled devices. 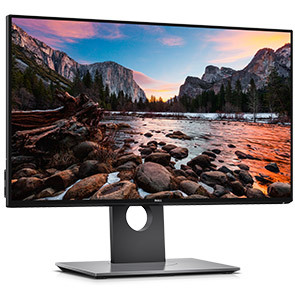 ASUS Designo MX27UC is an elegant UHD (3840 x 2160) monitor with USB Type-C connectivity. The USB 3.1 Type-C port can be used for data transmission and power delivery, and functions as an alternate DisplayPort input. It has an IPS-type panel and a wide 100% sRGB colour gamut. It has classic lines, an ultra-slim 1.25cm profile, a stylish sundial-inspired stand, and a metallic Icicle Gold finish. ASUS SonicMaster audio, incorporating ICEpower, Bang & Olufsen technology, gives Designo MX27UC crystal-clear sound. 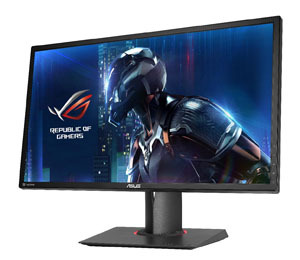 The 32-inch ASUS ProArt 5K UHD (model number not listed) professional monitor provides stunning 5120 x 2880 resolution images through as single DisplayPort connection. Designed for graphics professionals, it has a wide colour gamut with 100% Rec. 709, 99.5% Adobe RGB and 95% DCI-P3 color-space support. 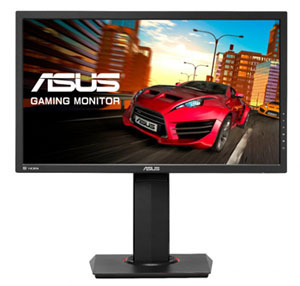 The ASUS ProArt PA27AQ monitor features a 2560 x 1440 WQHD panel with a 100% sRGB gamut. With a frameless design on all four sides, it is ideal for multi-display setups. Both ProArt monitors feature the exclusive ASUS ProArt Calibration Technology, which includes colour accuracy tuning and uniformity compensation for easy monitor calibration. It offers overall data mapping, correlation and calibration, and saves all colour parameter profiles on the display’s internal scaler IC chip instead of the PC (hardware calibration), so users do not have to recalibrate settings whenever the display is hooked up to different computers. Information on prices and release dates for all these models are not known at this time. 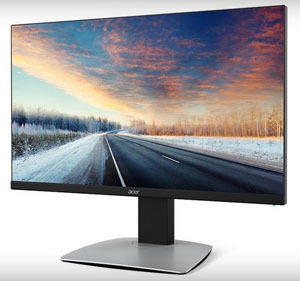 Acer have just announced their new BM320 monitor, a 32" screen designed for professional users. 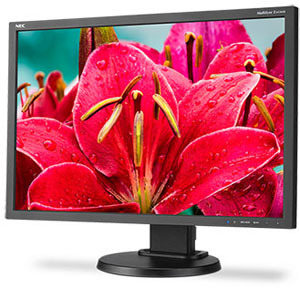 This new screen features an Ultra HD 3840 x 2160 resolution and a backlight system for professional-grade requirements. The BM320 supports 100% Adobe RGB colour gamut, while video editors and directors can work with confidence as it covers 100% of the Rec. 709 colour gamut and 90% of DCI-P3. The BM320 supports 10-bit colour depth, which provides 64 times more colour depth over conventional 8-bit monitors, and every unit is factory pre-tuned and tested to ensure a Delta E<2 colour accuracy. It comes with Uniformity Compensation to help reduce uneven brightness and colour fluctuations across the screen. The BM320 features a sleek ZeroFrame design which virtually eliminates the screen’s bezel for a seamless visual experience when multiple displays are put together. In addition, Acer’s ErgoStand lets users tilt, swivel, pivot or adjust the height of the monitor with ease, ensuring that they find the perfect viewing position effortlessly. No further information yet on specs, price or availability. 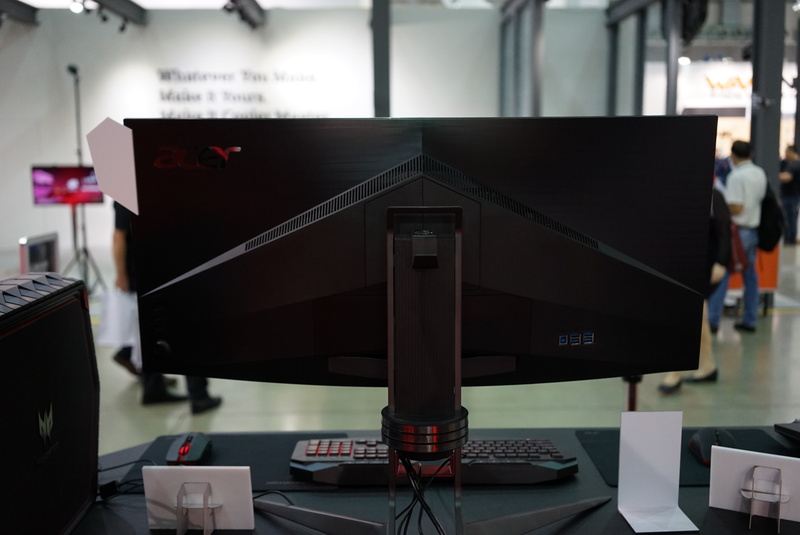 At Computex 2016, Asus have yesterday showcased a new monitor in their popular ROG Swift gaming range. The new PG248Q is 24" in size and offers an impressive spec for gaming needs. There is a 1920 x 1080 resolution, 1ms G2G response time, 180Hz overclockable refresh rate and support for NVIDIA G-sync. The new screen is based on a TN Film panel. The Swift PG248Q also boasts ASUS-exclusive GamePlus including crosshair, timer, FPS counter, Display Alignment and GameVisual technologies for six preset display modes. There's very little additional information about this screen but we expect to see DisplayPort and HDMI connections offered along with some USB 3.0 ports. The stand should offer tilt, height, swivel and rotate functions in line with the 27" ROG Swift models already available. We expect the screen will be flicker free also, and should offer ULMB support given the presence of G-sync and a suitable refresh rate. No word on pricing or availability yet. 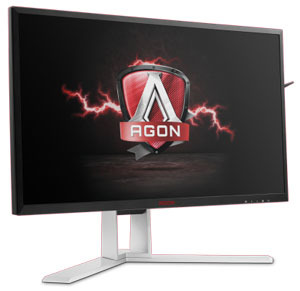 AOC have announced their new Premium line of gaming monitors, the AGON series. The first model to be released from this new range is the 27" AG271QX, powered by a 2560 x 1440 resolution TN Film panel with 1ms G2G response time and 144Hz refresh rate. The AG271QX is also compatible with AMD FreeSync (30 - 144Hz range). In other specs the screen offers 1000:1 contrast ratio, 350 cd/m2 brightness, 170/160 viewing angles, 16.7m colour depth and a standard sRGB gamut. With a focus on the demands of gamers the screen also has a low input lag mode. The AOC Low Input Lag mode disables picture post-processing on the monitor’s electronics and, therefore, accelerates the command pass-through from mouse, keyboard and gamepad to result in immediate actions. Additionally the AOC Shadow Control enables gamers to quickly adjust contrast in overly dark or bright areas without sacrificing the quality of well-balanced areas across the rest of the screen similar to technologies we've seen before like BenQ's Black eQualizer for example. 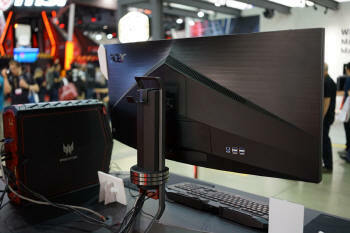 Gamers would also want perfect ergonomics and to be able to rely on convenient features to adjust their monitor. The AOC AGON ergonomic base provides plenty of comfort when enabling adjustments of height, tilt and swivel, and is accurately marked by a scale, so gamers can always jump back to their preferred settings. What is more, the stand is equipped with a carry-handle for easy transportation of the monitor for example to and from eSports events. When not using the headset, there is a practical holder at the side of the display to hook it over. Even more comfort is delivered by the eye-protecting AOC Flicker-Free Technology and the AOC Low Blue Light mode, both reducing eye strain, discomfort and fatigue during long gaming sessions. Monitor settings are key features when it comes to individuality, and they need to be easily accessible. Adjustable gaming presets will grant gamers exactly that. AOC has not just implemented changeable Game Mode Presets, but also added the AOC QuickSwitch Controller, enabling the user to switch effortlessly between modes and adjust brightness, contrast and other gaming features. There are D-sub, DVI, 2x HDMI and 1x DisplayPort connections provided along with a 4 port USB 3.0 hub. We know that AOC will be offering other AGON series screens (10 in total initially) in sizes from 24" to 35" with a range of flat and curved models, refresh rates of 144Hz and above (presumably overclocked) and resolutions from Full HD up to Ultra HD 4k offered. There will be some with FreeSync support like the 27" model covered above, and others with G-sync. Some will be TN Film based while others are IPS, and so it seems AOC are making a concerted effort to release some interesting new displays to compete with the likes of Asus and Acer who have been pushing the boundaries in recent times. NEC recently announced their new E series screen, the 24 inch E245WMi, aimed primarily at business users. The screen features an AH-IPS panel with 1920 x 1200 resolution (fairly rare nowadays),6ms G2G response time, 1000:1 contrast ratio, 250 cd/m2 brightness, 178/178 viewing angles and a standard sRGB gamut. The E245WMi offers a full range of DisplayPort, DVI-D and VGA connections and the stand has tilt, height, swivel and rotate adjustments also. There's an ambient light sensor also built in along with 2x 1W stereo speakers. The E245WMi-BK will be available in May 2016 at an estimated street price of $319 USD. AOC have recently announced the launch of their new 27" Q2781PQ display, featuring an AH-IPS panel and a 4-side borderless design. Until now, most borderless style screens have still had a thicker bottom bezel, with the sides and top being a thin plastic edge and inner panel border. From AOC's description it sounds like this model will offer the thin frame design along all 4 edges, making it an interesting option for multi-screen setups and for those looking to cut down on borders as much as possible. According to the press release it has 5.7 mm black borders on the upper, left and right sides and a 6.25 mm border on the lower side so overall very similar along all sides. It also comes with an interestingly design asymmetric stand. Spec wise the AH-IPS panel offers a 2560 x 1440 resolution, 4ms G2G response time, 1000:1 contrast ratio, 350 cd/m2 brightness, 178/178 viewing angles and a standard sRGB gamut. The screen is flicker free also. There are D-sub, 1x DisplayPort and 2x HDMI connections provided and the stand has a basic tilt adjustment only. The AOC Q2781PQ will be available in July 2016 at an MSRP of £279. At the end of March we brought you news of the massive 43" sized Philips BDM4350UC which was being launched, pushing the size of desktop monitors beyond anything we've seen before and well into the realms of TV sizes. 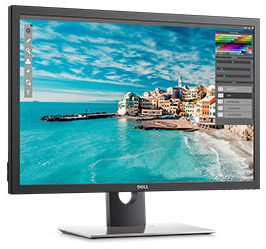 Dell are now set to join that sector with their very recently announced P4317Q display as part of their 'Professional' range of displays. The P4317Q will be 42.51" in size, like the Philips equivalent, and offers an Ultra HD 3840 x 2160 resolution. "Multi-client capabilities" are offered, allowing you to connect up to four independent clients to a single monitor with customized views, all without bezel breaks, so you can take total command of your tasks. It is being marketed by Dell as if it were 4 monitors in one (4x 1920 x 1080 areas) which given the massive screen size is at least realistic. 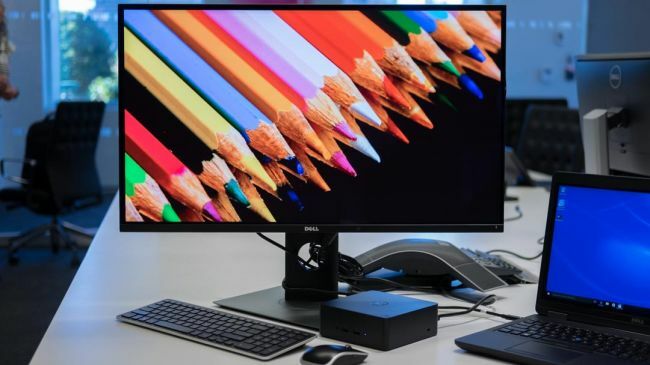 The spec varies a little from the Philips offering although we anticipate it will likely use the same TP Vision IPS-type panel in this Dell model given the size. We will confirm once we can get hold of a sample for review. The P4317Q offers a 8ms G2G response time, 1000:1 contrast ratio (Philips model was 1200:1), 350 cd/m2 brightness (Philips was 300), 178/178 viewing angles, 1.06 billion colour depth and standard sRGB gamut W-LED backlight. The stand offers tilt adjustment only but with VESA 100 and VESA 200 mounting options available. There are a wide range of connectivity options with 1 x DP 1.2, 1 x mini DP 1.2, 2 x HDMI 1.4 (MHL), 1 x VGA available. There are also 4x USB 3.0 ports, an audio input and headphone output, as well as 1 x RS232 port. There are two 8W speakers built in as well. The screen is listed on Dell's US website at $1349.99 USD at the moment, and we should have confirmation of a UK retail price in the very near future. We hope to review this screen in the coming weeks once it is available. Dell often seem to "leak" information of new screens before they are officially announced or listed on their websites. 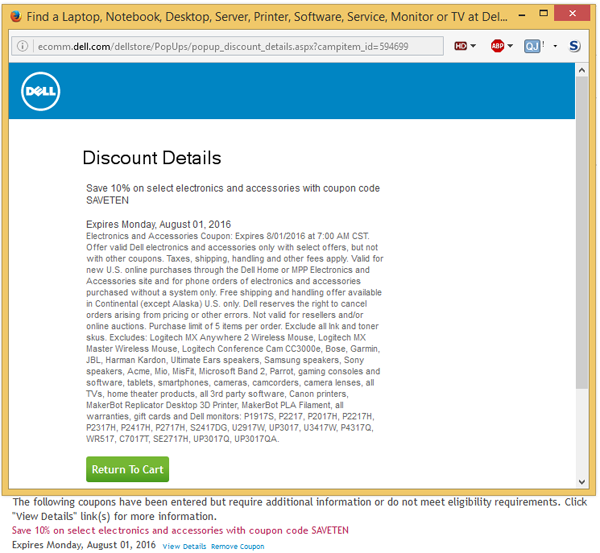 An eagle-eyed reader has noticed several new model names crops up in a Dell discount coupon as shown below. The models of particular note are shown below along with some logical speculation on our part. More info as we get it. Given the 2017 model dating, we expect to see these screens emerge during 2016 but some are likely to be later in the year. S2417DG - this is likely to be a 24" gaming monitor with G-sync capabilities based on the model name. Similar to the S2716DG we have already reviewed. We expect a 1920 x 1080 TN Film model here with features aimed at gamers. U2917W - looks to be a long overdue update to the U2913WM ultra-wide 29" model. There's not been many changes in the 29" panel market although LG.Display do now have a curved panel in this size, so it's possible the U2917W will feature that. UP3017 - not to be confused with their 30" OLED UP3017Q model which is also listed. Given the absence of the Q on this model we expect a non-4k resolution, so quite likely to be 2560 x 1600 as with older 30" models like the U3014 for instance. The UP stands for UltraSharp Premium so we expect this model to feature a wide colour gamut and hardware calibration support. U3417W - looks to be an update to the 34" ultra-wide U3415W model. There's been little development in the 34" panel market so it's tricky to know what will have changed with this update. Perhaps Dell will push the monitor refresh rate like Asus and Acer have with their PG348Q and X34 models? Although that doesn't feel a very "Dell" thing to do. 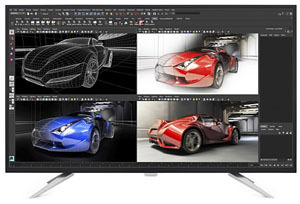 P4317Q - a new 43" ultra HD model, more information in this news piece. UP3017Q / UP3017QA - the exciting new 30" OLED model from Dell which is very interesting indeed. The A model should represent a version with a mounting arm instead of the stand (like they've done with new 24" and 27" UltraSharp models). The inclusion of this model here is at least good news and suggests it hopefully won't end up as vapour-ware as some have been concerned about. 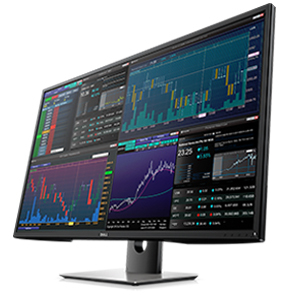 Marketed still as a monitor despite its massive 42.51" size, the new BDM4350UC is the successor to the very interesting 40" BDM4065UC we tested at the end of 2014. The design remains quite similar, being quite TV-like in appearance despite its target market as a desktop monitor. The stand has changed a little with a four legged metal design now being used. A glossy screen coating is kept though as before. This time Philips have moved to using an IPS-type panel instead of the VA panel they used in the 40" model before. The massive 42.51" screen offers a 3840 x 2160 Ultra HD resolution, 5ms G2G response time, 1200:1 contrast ratio, 300 cd/m2 brightness, 178/178 viewing angles, 60Hz refresh rate and 10-bit (8-bit+FRC) colour depth support. The screen is factory calibrated with a dE of <3 offered and there's even a "SmartUniformity" digital uniformity compensation feature included bringing uniformity to 96 - 105% across the screen. This time the screen is flicker free which is pleasing as that was one of our gripes with the old model. A W-LED backlight unit is used with sRGB colour space coverage. Connection wise there are 2x DisplayPort, 2x HDMI 2.0 (with MHL), VGA, 4x USB 3.0 an audio input and headphone jack. There are also 2 x 7W integrated speakers and 200 x 200mm VESA holes for mounting to an alternative stand or mount. PiP (Picture-in-Picture) and PbP (Picture-by-Picture) functionality are also included, including support for 4 connected devices (PbP). The screen is expected to be available late May/early June but pricing has not been confirmed yet. 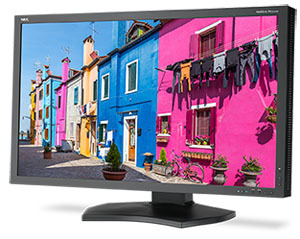 Philips recently announced the world’s first monitor with Quantum Dot Colour technology. With colours that are more vivid, consistent and truer-to-life than ever, the new 27-inch E-Line display 276E6ADSS delivers professional colour quality with 100 % NTSC and 99 % Adobe RGB support, all at a consumer-friendly price. Quantum Dot Colour is an innovative nanomaterial technology that produces incredibly accurate, saturated colour – in fact, over 30 % more colour than traditional sRGB LEDs. Additionally, it costs a fraction of most colour-critical technologies and uses 25 % less energy, so saves on energy bills as well. The monitor itself features a glossy white finish and silver stand design. The new 27-inch display is emblematic of the commitment of MMD to deliver better resolution and image quality to all users – because it isn't just professionals who benefit from fidelity in colour reproduction. The expansive colour palette is also ideal for movie lovers, amateur photographers and designers who want the confidence of consistent and true colour reproduction. The new screen offers a 27" IPS panel with 1920 x 1080 resolution, 5ms G2G response time, 1000:1 contrast ratio, 300 cd/m2 brightness, 178/178 viewing angles, 60Hz refresh rate and 16.7m colour depth. DVI, VGA and HDMI (with MHL) are provided for connectivity. 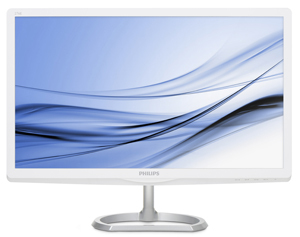 The new Philips 276E6ADSS display should be available now at an RRP of £239.99. 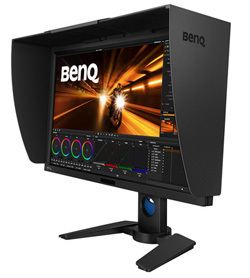 BenQ recently announced their new high-end PV series monitors for advanced cinematic and video post-production. For editors and colourists that demand uncompromising colour accuracy and high resolution, the PV3200PT and PV270 commercial monitors fit the bill for video editing, visual effects, and colour correction and management. 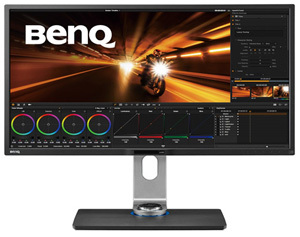 The PV3200PT is BenQ’s first monitor designed specifically with video post-production engineers in mind. Ideal for video production, this wide-angle 32” IPS monitor features high 4K UHD (3840x2160 pixel) resolution to scrutinize images to the finest details. The PV3200PT’s colour gamut covers 100% Rec.709 and 100% sRGB. This monitor includes hardware calibration support and includes the Palette Master Element calibration software to adjust the monitor’s colour gamut, white point, colour temperature and luminance, among other settings. With hardware calibration and a 14-bit 3D LUT, an average Delta E≦1.5 is achieved to deliver high colour accuracy and reproduction for a true representation of the original storytelling images. An optional Software Development Kit (SDK) allows studios or calibration software provider to be more involved in customizing colour calibration settings. The brightness uniformity feature maintains the monitor’s display performance by ensuring even brightness throughout the display. An included OSD controller provides user-friendly tactile control over the on-screen menu for additional convenience and efficiency. The feature-rich PV270 is a 27” IPS professional monitor with QHD (2560 x 1440 pixel) resolution with expansive colour spaces covering 100% Rec.709, 96% DCI-P3 and 99% Adobe RGB required in digital cinematic video post-production and photo retouching. With Technicolor Color Certified certification, the PV270’s display luminance, colour gamut, and gamma are Hollywood-ready. Moreover, the X-Rite powered Palette Master calibration software assists hardware calibration for conformance to artists’ requirements, taking the suspense out of the final picture. As with the PV3200PT, the PV270’s optional SDK allows further colour calibration customization. Extreme colour accuracy with average Delta E≦1.5 should inspire confidence for colourists to produce the best pictures possible with precise colour consistency across the entire production workflow. With 24P support, videos can be viewed with correct timing at their native cinematic frame rates. Several features set the high quality PV270 apart from its competition allowing convenience and to increase work efficiency. The built-in backlight sensor quickly stabilizes the monitor’s brightness while the brightness uniformity feature maintains consistent brightness across the viewing surface. The GamutDuo function allows artists to simultaneously review images on-screen side-by-side from two sources using two different colour standards (e.g. Rec.709 and DCI-P3). With film production expanding to worldwide collaborative efforts, the PV270’s Color Display Clone software can be used to detect differences in ambient light to automatically adjust the displayed colour temperature for consistent colour performance across remote offices and environments. The PV270 also includes a monitor hood to reduce reflections on the screen’s surface and mitigate display contrast to improve conditions for image retouching and soft proofing. The PV3200PT will be available in March 2016, while the PV270 will launch in April 2016. 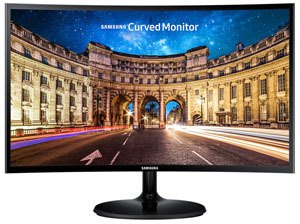 There's been a few new models announced from Samsung recently with quite highly curved VA panels (1800R) and AMD FreeSync support. We will try to summarise these new screens briefly here for you. C27F591FD - this model comes in a silver and white colour design with a frameless design. The VA technology (expected Samsung SVA) screen is 27" in size and offers a 1920 x 1080 resolution, 4ms G2G response time, 3000:1 contrast ratio, 250 cd/m2 brightness and 178/178 viewing angles. 60Hz refresh rate is offered but the screen also supports AMD FreeSync over HDMI and we presume also over the DisplayPort interface. An additional VGA connection and audio jack are offered as well. Interestingly Samsung talk about their "active colour crystal technology" being used on this model, offering an extended colour gamut of 119.3% sRGB (81% NTSC). This is potentially a Quantum Dot type technology. Either way, users should be aware that this is a wide(r) gamut model and so need to think about their uses and any potential issues with their content. Flicker free backlighting is offered and there are 2x 5W speakers and a basic tilt adjustment stand only (VESA mounting supported). The screen is expected to be available in April and is currently available to pre-order in the USA at ~$350. C24F390FH (23.5") and C27F390FH (27") are the two new CF390 series models. Their design differs from the CF591 model mentioned above with glossy black plastics used and a standard all-round bezel as opposed to the frameless design. They are very thin models though measuring only 11.9mm thickness. Both models feature a VA technology panel, expected to be some of the new Samsung SVA panels in production and offer 1920 x 1080 resolution, 4ms G2G response time, 3000:1 contrast ratio, 250 cd/m2 brightness, 178/178 viewing angles and 16.7m colour depth. Unlike the CF591 above, they are standard gamut (sRGB) models. The backlights are flicker free and there are basic tilt-only stands provided (VESA mounting also available). There are HDMI 1.4a (with Adaptive-Sync) and VGA connections offered along with a 3.5mm headphone port. No DP connections on these models. Both new CF390 models are expected to be available in April Worldwide. The C24F390FH is available to pre-order in the US for ~$230. The Video Electronics Standards Association (VESA) yesterday announced it has published version 1.4 of the DisplayPort (DP) audio/video standard. The first major update to DisplayPort since version 1.3 was released in September 2014, DP 1.4 is also the first DP standard to take advantage of VESA’s Display Stream Compression (DSC) technology. DSC version 1.2 transport enables up to 3:1 compression ratio and has been deemed, through VESA membership testing, to be visually lossless. Together with other new capabilities, this makes the latest version of DP ideally suited for implementation in high-end electronic products demanding premier sound and image quality. In September 2014, VESA published DP 1.3, which has been the baseline for new system development. DP 1.3 increased the maximum link bandwidth to 32.4 Gbps, with each of four lanes running at a link rate of 8.1 Gbps/lane, a 50-percent increase over the previous DP 1.2a specification. DP 1.3 added extra protocol flexibility to enable more seamless operation over the USB Type-C connector in the form of the DisplayPort Alt Mode. The increased link rate increased the uncompressed display resolution support up to 5K x 3K (5120×2880), and also upped the MST resolution, enabling simultaneous use of two 4K UHD monitors, each with a pixel resolution of 3840×2160, when using VESA Coordinated Video Timing. We have yet to see DP 1.3 utilised on any monitor though although it is expected to be used to potentially offer high resolution / high refresh rate panels during 2016. Eizo have recently announced the release of two new 24.1" monitors in their ColorEdge range, the CG2420 and CS2420. Both offer a 1920 x 1200 resolution and 16:10 aspect ratio format. They both offer a wide colour gamut backlight with 99% Adobe RGB coverage. The ColorEdge CG2420’s panel also covers 98% of the DCI-P3 colour space used in post-production. In addition, both models offer 10-bit colour depth and a 16-bit LUT with factory gamma correction. They feature DisplayPort, HDMI and DVI connections along with a 3 port USB hub. The stand offers tilt, height, swivel and rotate adjustments as well. Both the monitors feature a sleek new cabinet design with slim bezels which are 39% smaller than their predecessors’. A carrying handle is built-in for easily moving the monitor between locations or within the studio. The flat design uses electrostatic switches on the front bezel in place of traditional buttons for seamless access to monitor settings. The switches light up using an LED for viewing in dimly-lit work environments. EIZO bundles its proprietary ColorNavigator 6 software with both monitors for users that require a wide variety of calibration functionality. Both models come with Eizo's Digital Uniformity Equalizer (DUE) correction feature as well to improve uniformity across the panel. The CG2420 (pictured) is the higher end professional-level model for use in photography, design, print, and post production. It features a built-in self-calibration sensor for hassle-free monitor maintenance that ensures optimal colour reproduction and image consistency throughout the creative workflow. The ColorEdge CS2420 includes many of the advanced features of EIZO’s ColorEdge line-up while meeting the varying needs and budgets of hobbyists and prosumers that want to create, edit, and enjoy photography, illustration, and more. This model offers a 10ms G2G response time, 1500:1 contrast ratio, 400 cd/m2 brightness and 178/178 viewing angles. It even comes bundled with a shading hood (which is optional on the CS2420 as an extra). The panel technology is listed as IPS although with the spec shown it seems to be an unusual panel with that contrast ratio and not one we are aware of at the moment. The CS2420 has a different spec with 15ms G2G response time, 1000:1 contrast ratio, 350 cd/m2 brightness, 178/178 viewing angles. Again it is listed as an IPS panel. Some of the features of the CG model are not offered. See the full specs pages linked for more information. The ColorEdge CG2420 and CS2420 will be shipping from February. Date of availability varies by country. Quietly announced at CES this year was a new screen from Lenovo. The Y27g is 27" in sized and is of particular interest since it feature a 27" curved VA panel, with 144Hz refresh rate also. It looks like it will be based on the Samsung SVA panel detailed in our panel parts database which is scheduled to go in to production during Q1. We know from the Lenovo information that the screen has an 1800R curvature, 1920 x 1080 resolution, 8ms G2G response times, 3000:1 contrast ratio, 300 cd/m2 brightness and 178/178 viewing angles. It also includes NVIDIA G-sync support to go along with the high 144Hz refresh rate. There are 4x USB 3.0 ports included along with a headphone port and headphone hanger. Tilt, height and swivel adjustments are offered by the stand. Given G-sync is used there is certainly a DisplayPort connection offered, although we can't see confirmation as to whether HDMI will also be included or not. The Y27g is expected to be available around June time at $549 USD. There is also apparently a special "Razer-branded" version at $599 which has a lighting system integrated to match your Razer Chroma keyboard or mouse. NEC have just announced the PA322UHD-2 display, which includes all the features of the existing PA322UHD model and now updates the option slot with support for 4K UHD inputs, including an installed, switchable DisplayPort 1.2 and HDMI 2.0 option. The Open Pluggable Specification (OPS)-compliant option slot gives videographers, photographers, print production specialists and others added flexibility to use the PA322UHD-2 in an even wider range of existing workflows. In addition to the installed OPS, the NEC Display Solutions 3G/SD/HD-SDI input card (SB-04HC) and the HD-SDI input card (SB-01HC) also are compatible with the PA322UHD-2. The display uses a wide gamut white LED backlight and an IGZO technology IPS-type LCD panel that delivers excellent image quality with lower power consumption than comparable LCD displays while delivering 99.2 percent coverage of the Adobe RGB colour space. There is a 14-bit 3D internal programmable lookup tables (LUTs) for calibration as well. There is support for a multitude of refresh rates, including 24, 30, 50, 60, 85, 100, and 120 Hz modes depending on the resolution. There is an integrated USB 3.0 hub (two up, three down) with DisplaySync Pro, a high resolution keyboard / video / mouse (KVM) switch that can control two computers with only one keyboard and mouse. 2x DisplayPort 1.2 inputs, one HDMI 2.0 input and the option of either two DVI-D or four HDMI 1.4 inputs. The MultiSync PA322UHD-BK-2 ships with a four-year limited 48-hour advanced exchange parts and labour warranty, and will be available in February 2016 at a minimum advertised price of $2,999. The AOC U2879VF comes in an ultra-slim design that combines a slick glossy bezel with an elegant silver stand. The screen is based on a 28" TN Film panel and it is primarily aimed at gamers with a fast 1ms G2G response time and AMD FreeSync support to go along with the high DPI resolution. Spec wise the panel offers 3840 x 2160 resolution, 1ms G2G response time, 1000:1 contrast ratio, 300cd/m2 brightness, 170/160 viewing angles, 1.07b colour depth (8-bit+FRC) and a standard sRGB gamut W-LED backlight. The screen has only a 60Hz refresh rate because of the Ultra HD resolution and current DP interface bandwidth limitations. The integrated Picture by Picture (PBP) function makes it possible to view content from two input sources at the same time. Thanks to the monitor’s 4K UHD resolution of 3840 x 2160 pixels, both of the two virtual screens are displayed with a high pixel density (138 PPI). To improve user’s comfort while using the monitor, the AOC U2879VF includes Flicker-Free technology also. 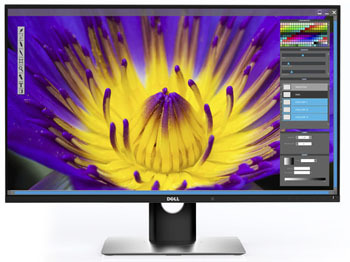 Following on from the early information released about the 24" U2417H (and U2417HA with monitor arm), Dell have now released information about their new 27" UltraSharp models. The U2717D (and U2717DA with monitor arm instead of stand) will replace the existing U2715H model which was launched in late 2014. The new model will be an "Infinity Edge" screen like the smaller 24" models, with a 7.3mm edge top and sides and 8.4mm along the bottom. The regular model (non-A) will offer a stand with full ergonomic adjustments for tilt, height, swivel and rotate. The A model replaces the stand with an arm as we discussed when looking at the 24" versions. Like the U2715H it will replace, the new model is a 27" IPS based screen with 2560 x 1440 resolution. It will offer a 6ms G2G response time (fast mode), 1000:1 contrast ratio, 350 cd/m2 brightness, 178/178 viewing angles, 8-bit colour depth and 99% sRGB coverage from its W-LED backlight. It will come factory calibrated with dE < 3 and there are 2x HDMI 1.4 (with MHL), Mini DisplayPort, DisplayPort, DP out (for daisy chaining) and 4x USB 3.0 ports available for connectivity. No word on release date or pricing yet although they were originally expected to be available late Feb so that date still looks likely. In August last year we brought you some advanced news about some updated UltraSharp models from Dell expected in early 2016. We now have more information about their new U2417H, expected to be the replacement for the excellent and very popular U2414H. Dell have reduced the total border size on the new screen and given it a new 'InfinityEdge' name. The side and top border is now only 5.3mm (down from 6.05mm) with the bottom border being only 8.33mm (down from 18.8mm). The screen remains 23.8" in size with a 1920 x 1080 resolution IPS-type panel. In other specs the screen offers 6/8ms G2G response time, 1000:1 contrast ratio, 250 cd/m2 brightness, 178/178 viewing angles and a standard sRGB gamut backlight (W-LED). The monitor comes factory calibrated (report included) with an average DeltaE of < 2 which is an improvement over the < 4 specified for the previous model. The stand on the U2417H offers a full range of tilt, height, swivel and rotate functions and there are DP 1.2, DP 1.2 output (for MST Daisy Chaining), Mini DP 1.2, HDMI 1.4 (with MHL 2.0) and 4x USB 3.0 ports provided for connectivity. A 3.5mm audio output port is also included, but there are no integrated speakers on this model. There is also the U2417HA model being launched at the same time. While there isn't a full product page on Dell.com that we've seen, we can tell from the user guide for the screen which is available that this seems to be the same screen but with a different stand option. In fact rather than a traditional stand, the U2417HA will come with an "arm" option, hence the "A" in the product name. There's lots of images in the user guide showing how this would work and attach, but it's basically a desk mount option as opposed to a normal stand. We've included an image above to give you an idea of how it would look. We still expect both screens to be released in February sometime although pricing has not been announced in the US or UK regions yet. LG are set to release a new 34" screen in their range, this time with 3440 x 1440 resolution and AMD FreeSync support. 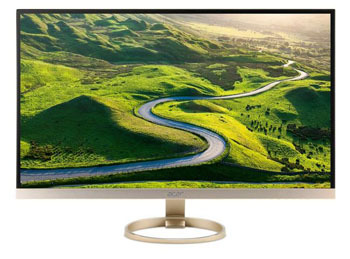 The 34UC98 has a 21:9 ultra-wide IPS technology panel with a 3800R curvature. Spec-wise the screen offers a 5ms G2G response time, 1000:1 contrast ratio, 300 cd/m2 brightness, 8-bit+FRC colour depth (1.07b) and 178/178 viewing angles. The specification says that the FreeSync range is 55 - 75Hz so it can push beyond the native 60Hz refresh rate of the panel here, much like Acer's Predator XR341CK can. A flicker free backlight is used and low blue light modes are also included. It also includes a factory calibration. The stand offers tilt and height adjustments and can also be removed for VESA 100 mounting if you want. There are DisplayPort 1.2a, 2x Thunderbolt 2, 2x HDMI 2.0 and 2x USB 3.0 ports included for connectivity. At least one of these USB 3.0 ports is Type-C with quick charging functionality. DP 1.2, HDMI 2.0 and Thunderbolt 2 support 3440 x 1440 @ 60Hz, with DP 1.2a being required to use AMD FreeSync with this model. 2 x 7W Maxx Audio speakers are also included along with a headphone port. The screen is expected to be available shortly with a suggested retail price of $1199.99 in the US. 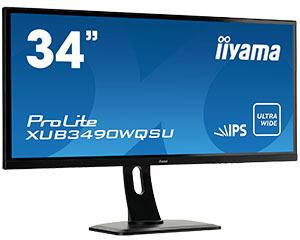 Iiyama are set to enter the popular 34" ultra-wide space with their new XUB3490WQSU display. The screen offers a 3440 x 1440 resolution and 21:9 aspect ratio. It's based on an IPS panel so offers the wide viewing angles and image stability we have come to expect from other models in this size. In other specs there is a 5ms G2G response time, 1000:1 contrast ratio, 320 cd/m2 brightness, 178/178 viewing angles, sRGB colour space and 1.07b colour depth (8-bit+FRC). Unlike some other screens in this size which are aimed at gamers, Iiyama have not focused on providing any overclocked refresh rate or support for G-sync/FreeSync here, helping to keep the cost down and aiming the screen more at general all-round use. There are 2x 3W integrated speakers, a headphone connection, PiP/PbP support and a low blue light filter mode. There are DisplayPort, 3x HDMI (one is V2.0, one with MHL) and a 4 port USB hub (2x v2., 2x v3) included for connectivity and the stand offers tilt, height and swivel adjustments. The XUB3490WQSU will be launched across Europe and is now available at a retail price of €799 incl. VAT. LG.Display continue to invest in their borderless neo-blade panels in varying sizes including 23.8", 27" and even 31.5" it seems. The main panel of note from LG.Display is the forthcoming LM375UW1 panels. This is 37.5" in size and will offer an unusual 3840 x 1600 resolution, giving it a perfect 2:4:1 aspect ratio. This is basically the same as 21:9 ultra-wide format but it is the exact aspect ratio of Blu-ray content so perhaps this has something to do with the developments in 4K Blu-ray this year. On a screen this size the pixel pitch should be very similar to the 40" 3840 x 2160 16:9 aspect ratio panels we've seen so far. The new panel is based on LG.Display's IPS technology with specs listed as 14ms G2G response time, 1000:1 contrast ratio and 178/178 viewing angles. It is expected to go into production in Q3 2016. The Samsung roadmaps are annoying as there’s no part numbers and limited specs listed, so it’s hard to try and decipher what panels are what. Looks like they will have a 31.5” panel with 2560 x 1440 res (QHD) with curved format and 144Hz refresh rate in Q3 2016. This is likely to be SVA technology based on the information we've seen in the past. Of interesting note also are two very large and unusual panels again planned for possible Q3 2016 production. These are 41" and 49" in size and a very, very wide 32:9 aspect ratio and FHD+ resolution as it is listed in the spec (not sure what that actually is although possibly 3840 x 1080)! Whether they will be used as monitor panels or not is questionable given the format but they were listed in the roadmap with other monitor modules. They have an 1800R curvature according to the preliminary specs. Finally Samsung have a 31.5" sized panel coming in Q3 also with a whopping 8K4K (7680 x 4320) resolution and Adobe RGB colour space coverage which clearly positions it as a premium professional grade panel. AU Optronics have some limited information available as well. 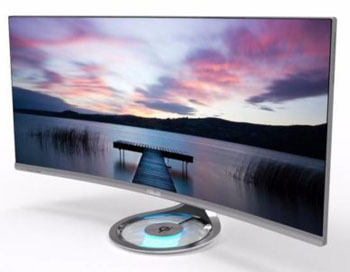 There are 30” and 35” ultra-wide curved panels coming in Q3 and Q2 respectively. These will be VA panel technology with 3440 x 1440 resolution and 144Hz refresh rate which would be a first at that resolution. In fact, this would push things beyond DP 1.2 bandwidth limitations as we understand it, so this might require the forthcoming DP 1.3 interface to be practical. In other specs they panels also offer 3000:1 contrast ratio, 300 cd/m2 brightness, 172/178 viewing angles and 2000R curvature. Our detailed panel parts database has been updated as best we can with the new information. 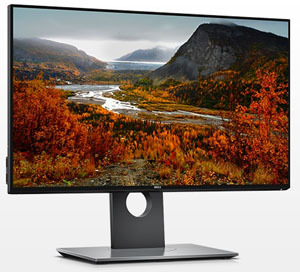 At CES yesterday Dell showcased their new flagship monitor, the first monitor in their range (and really the first mainstream-brand monitor on the market) to used and OLED display! 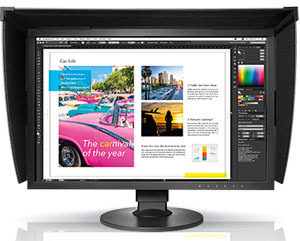 The 30" sized UP3017Q offers some amazing specs and is aimed primarily at professional users. It's part of their UltraSharp Premium (UP) range of displays. The UP3017Q offers an UltraHD resolution of 3840 x 2160 and offers a wide colour gamut covering 100% of the Adobe RGB reference space and 97.8% of the DCI-P3 reference space. The colour depth is also 1.07b as well through what we assume will be a native 10-bit colour depth given the cost and specs. Black depth is a key benefit of OLED as well, and this screen can offer a typical contrast ratio of 400,000:1. The response time is also an amazing 0.1ms. One source is stating it has a 120Hz refresh rate although we have not seen that confirmed anywhere else, including the Dell press release so we remain sceptical on that part. Especially considering the target audience and bandwidth requirements at Ultra HD resolution. Apparently it is provided with either a monitor arm or traditional stand. Connectivity wise we know it will; have a USB Type-C connection enabling single cable power, video and data connectivity with compatible systems. There also appears to be Thunderbolt featured. To prevent image burn-in, which can affect OLED, Dell has “incorporated a pixel shifting algorithm to prevent image burn-in.” Given the shorter life-time of OLED as well, a human motion sensor is incorporated to help turn off the display when not being used. There's plenty of pics from CES at Engadget as well if you want to take a further look. The Dell UltraSharp 30 OLED monitor will be available March 31, 2016 on Dell.com in the United States starting at $4,999. More information and detail when we get it in this article. With CES 2016 starting today in Las Vegas we are starting to see an influx of news pieces from the various monitor manufacturers. 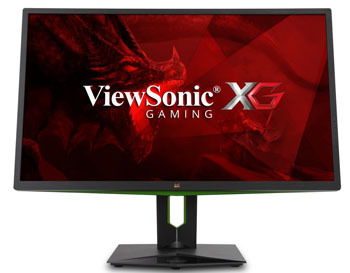 ViewSonic are showing off an interesting new range of gaming monitors at this years event. The XG Series promise ultra-fast response times, low input lag, and critical colour depth. he XG Series is specially engineered to meet the demanding needs of gamers and is loaded with the premium features needed to dominate and defeat any and all opponents. From gamer-inspired ergonomic design features like an integrated headphone hook and cable management, to Flicker-Free technology and Blue Light Filter for eye comfort, everything about ViewSonic’s XG Series has been considered with the gamer in mind to help. The XG2401 is a 24-inch Full HD monitor packed with features like a 144Hz refresh rate, and AMD’s FreeSync variable refresh rate technology that eliminate screen tearing and stuttering for fluid gameplay during fast-paced action scenes. A blazing-fast 1ms response time (TN Film panel on this one) and low input lag provides smooth screen performance - even in the most graphic-intense sequences. For optimum speed and performance, SmartSync technology automatically selects the best refresh rate, response time, and lowest input lag needed in FPS games. A black stabilization function helps players spot enemies lurking in the dark, while maintaining brilliant rich colours and contrast. The XG2401 will be available for a MSRP of $404.00 (USD) and starts shipping late January. Expect some additional information to emerge over the coming weeks and during CES and hopefully more detailed specs. With CES 2016 starting today in Las Vegas we are starting to see an influx of news pieces from the various monitor manufacturers. 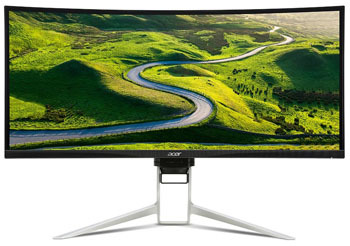 Acer’s next generation XR series, the XR342CK monitor with an UltraWide QHD (3440 x 1440) resolution and a 34-inch 21:9 panel with a 1900R curvature will be showcased at this years event. This looks to be an updated model to the XR341CK we reviewed back in July, which has only more recently been released to retail. Although expect there to be a fairly long time before this new model appears anywhere of course as it's only just being displayed at the CES event. According to the info available in the press release many of the features appear to be similar to the old model, with and IPS panel, sRGB gamut, DTS sound speakers, AMD FreeSync, ambient light system, PiP/PbP and daisy chaining support are all provided as before. The press release does talk about a swivel function on the stand which would be a new and welcome feature enhancement to go along with the tilt and height adjustments that the old model also offered. The OSD controls have been reworked and now includes buttons at the rear of the screen as well as a joystick (JOG button) for more intuitive control. Apparently in EMEA the XR342CK will be available in March with prices starting at €1,099. The new monitors will be gradually rolled out to other regions. Expect some additional information to emerge over the coming weeks and during CES and hopefully more detailed specs. The Acer R1 series monitors with ultra-thin enclosures under 7mm are ideal for everyday computing in any space. The stylish ZeroFrame design maximizes the view and minimizes visual clutter with a bezel so thin you barely notice it, providing a seamless viewing experience for multi-monitor setups. Combining Acer Flicker-less and Blue Light Filter technologies with 5 to 15 degree adjustable tilt, the R1 series is easy on the eyes, providing a comfortable viewing experience. Green credentials feature EcoDisplay and ENERGY STAR 6.0 certification as well as mercury-free construction. The R1 series boasts Full HD (1920 x 1080) resolution and will be available in 21.5-, 23-, 23.8-, 25- and 27-inch screen sizes. 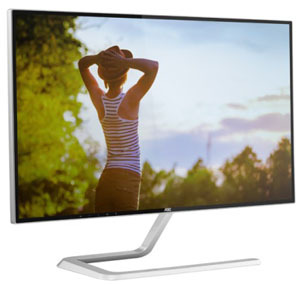 The Acer H7 series (pictured) monitors are the world’s first to support USB Type-C, so that users can conveniently transfer data and display content from notebooks or smartphones, while charging them at the same time through just one cable. With a premium ZeroFrame design, diamond-cut and brushed-metal stand, the Acer H7 series models are offered in 25-inch and 27-inch options. They also boast WQHD (2560 x 1440) display resolution, superior audio with Acer TrueHarmony and DTS™ Sound and come outfitted with super-fast USB Type-C and HDMI 2.0 ports. These features immerse the user in beautifully portrayed high-resolution content for the home or office. The H7 series supports 100 percent of the sRGB color gamut, delivering the color space reproduction desired by design professionals and visual enthusiasts for accurate color matching across applications and print output. With CES 2016 starting today in Las Vegas we are starting to see an influx of news pieces from the various monitor manufacturers. Displayed for the first time will be the MG 4K Series gaming monitors. There are two models in sizes of 28" and 24", both sporting an Ultra HD 3840 x 2160 resolution. The 28" MG28UQ features a TN Film panel with 1ms G2G response time, while the 24" MG24UQ (pictured) uses an IPS panel which we expect to have a response time spec around 4ms G2G on paper. Both offer VESA adaptive-sync support so should be FreeSync ready. Both monitors feature ASUS GamePlus in-game enhancements, ASUS GameVisual technology for optimized gaming visuals, and ASUS Ultra-Low Blue Light filter technology for comfortable viewing. No pricing or release dates listed yet. Additionally Asus are also showcasing the long-awaited PG348Q, a 34" ultra-wide screen for gamers which we first heard about last June and provided more information on in September. The latest press release confirms the monitor will offer 3440 x 1440 resolution, a 100Hz overclocked refresh rate, NVIDIA G-sync support and a frameless panel design. Again, no word on pricing or release dates yet. Expect some additional information to emerge on all 3 screens over the coming weeks and during CES.